By adopting high resolution encoders, Leadshine easy servo drives apply servo controls on stepper motors, the same mechanism in those expensive brushless servo drives. In a Leadshine easy servo system, shaft position of the stepper motor is fed back to the servo drive in real time. The easy servo drive can then close the position loop and correct any position errors to eliminate loss of steps commonly seen in open-loop stepper motors. Leadshine easy servo drives inherit favored features of both open loop stepper and brushless servo drives. When combined with easy servo motors (stepper motors with encoders), Leadshine easy servo systems solve the fatal problem “loss of steps” of open loop step systems. Other drawbacks of open loop stepper systems like high motor & drive heating and noise are also significantly improved. At fractional cost of expensive brushless servo systems, Leadshine easy servo system can upgrade your stepper systems to servo like performance with extra low motor heating, quick response & acceleration, and no torque reservation. In comparison to brushless servo systems, Leadshine easy servo systems outperform in much lower cost, no hunting, no overshooting, almost zero settling time, no tuning for most applications. Click the “Main features” tab to see illustration, or click here to read more about what is Leadshine easy servo system. Currently, Leadshine offers two series of easy servo drives. The ES-D series easy servo drives which take input voltage of 20-80 DC or max 80AC input to power motors from NEMA 23 to 34. Our ES-DH series easy servo drives can take direct 110 / 120 or 220 / 230 AC input to get rid of power supplies and power motors up to NEMA 42 easy servo motors to provide huge torque for big machines. Due to closed loop control and adoption of advanced control algorithm, the ES series easy systems can always implement 100% torque of the motor, and do not need the huge 50% torque reservation in normal open-loop stepper systems. This feature significantly improves system high speed performance. While open-loop stepper systems are typically adopted in applications under 1,000 rpm, the ES series easy servo systems are ideal for many applications up to 2,000 RPM, sometimes even for 3,000 RPM! Unlike a conventional stepper drive, the ES easy servo drives adopt vector control and filtering, producing a smooth motion with minimum torque ripples. Extra low motor noise is achieved. Since the ES easy servo is a stepper motor based system, it operates in synchronism with command pulses and has no hunting problem. When it stops, its position is completely stable and does not fluctuate. It is a great feature of the ES when rapid motions with a short distance are required and it is ideal for applications such as bonding and vision systems in which hunting would be a problem. Since the ES easy servo system is a stepper motor based system, so it has the advantages of high stiffness at standstill, high torque at starting and low speed, eliminating gear box. The ES adopts sophisticated control algorithms to take advantage of high-torque capability, providing direct-drive of high inertia loads such as flywheels and belt drives. These load inertials may be as large as 100 times the motor inertia while still providing smooth positioning control. Conventional servo systems typically cannot exceed a 10:1 inertial mismatch. Unlike a servo system which usually needs the engineer to spend a long time to learn how to use tuning tools and tune the gains for a satisfying performance, the ES series easy servo is ready for operation within a very short period of time. Set the microstep resolution and operating current, then the system is ready and offers high performance approaching to a fine tuned servo. Save time and save cost. Due to combining the features of both brushless servo drives and stepper drives, Leadshine easy servo drives are suitable for both upgrading conventional stepper systems, and replacing brushless servo systems. While conventional stepper systems are typically adopted for applicatons of 1,000 RPM or below, Leadshine easy servo drives can easily power control systems at least to 2,000 RPM (even higher) with much fast acceleration, much lower heating , higher torque, no loss of steps, smoother motor movement. In comparison to brushless servo drives, Leadshine easy servo drives can power control systems with much high starting & low-speed torque, no hunting, no overshooting, zero setting time, lower costs, and almost "No Tuning". Hardware Installation Manual of the ES-D Easy Servo Drives. 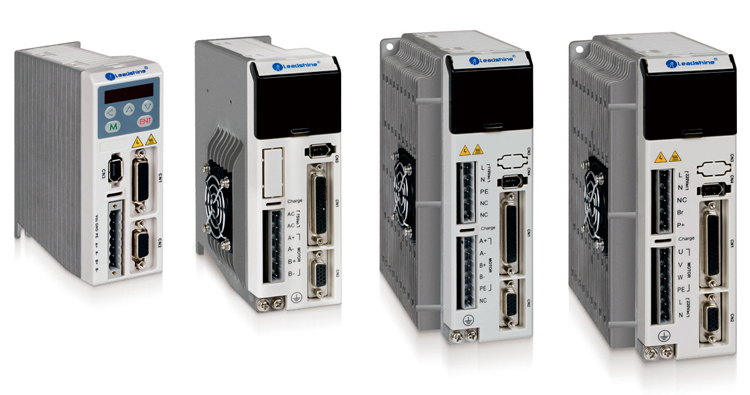 Software Manual of the ES-DH and ES-D Easy Servo Drives. Easy servo drives taking max 100 VDC or 80 VAC and capable of powering NEMA 23 and 34 easy servo motors for closed loop controls. Featured with no loss of motor synchronization (closed position loop), no loss of steps, no torque reservation, high torque, no hunting, no overshooting, and no tuning for most applications. 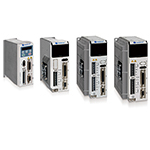 Direct 110 /120 or 220 / 230 VAC input easy servo drives capable of driving NEMA 34 and 42 easy servo motors for closed loop control. Featured with no loss of motor synchronization (closed position loop), no loss of steps, no torque reservation, high torque, no hunting, no overshooting, no power supply needed, and no tuning for most applications.